CinemaVIEW• RWU Spring 2019: THE TIMELESSNESS OF BILLY WILDER'S "SUNSET BOULEVARD"
THE TIMELESSNESS OF BILLY WILDER'S "SUNSET BOULEVARD"
Billy Wilder's "Sunset Boulevard” is the portrait of a forgotten silent star, living in exile in her grotesque mansion, screening her old films, dreaming of a comeback. But it's also a love story, and the love keeps it from becoming simply a waxworks or a freak show. Gloria Swanson gives her greatest performance as the silent star Norma Desmond, with her grasping talons, her theatrical mannerisms, her grandiose delusions. William Holden tactfully inhabits the tricky role of the writer half her age, who allows himself to be kept by her. But the performance that holds the film together, that gives it emotional resonance and makes it real in spite of its gothic flamboyance, is by Erich von Stroheim, as Norma's faithful butler Max. The movie cuts close to the bone, drawing so directly from life that many of the silent stars at the movie's premiere recognized personal details. In no character, not even Norma, does it cut closer than with Max von Mayerling, a once-great silent director, now reduced to working as the butler of the woman he once directed--and was married to. There are unmistakable parallels with von Stroheim, who directed Swanson in "Queen Kelly” (1928), whose credits included "Greed" and "The Merry Widow,” but who directed only two sound films and was reduced to playing Nazi martinets and parodies of himself in other people's films. 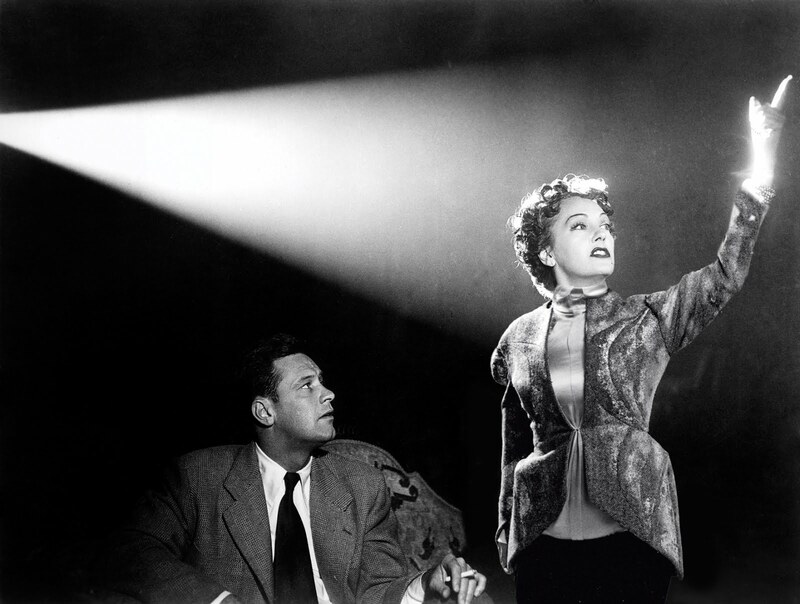 In "Sunset Boulevard,” Desmond screens one of her old silent classics for Joe Gillis, the young writer played by Holden. Max runs the projector. The scene is from “Queen Kelly.” For a moment Swanson and von Stroheim are simply playing themselves. Later, when Joe is moved into the big mansion, Max shows him to an ornate bedroom and explains, "It was the room of the husband.” Max is talking about himself; he was the first of her three husbands, and loved her so much he was willing to return as a servant, feeding her illusions, forging her fan mail, fiercely devoted to her greatness. In one of the greatest of all film performances, Swanson's Norma Desmond skates close to the edge of parody; Swanson takes enormous chances with theatrical sneers and swoops and posturings, holding Norma at the edge of madness for most of the picture, before letting her slip over. We might not take her seriously. That's where Max comes in. Because he believes, because he has devoted his life to her shrine, we believe. His love convinces us there must be something worth loving in Norma, and that in turn helps explain how Joe can accept her. Norma of course is not a wrinkled crone. She is only 50 in the film, younger than stars such as Susan Sarandon and Catherine Deneuve. There is a scene during Norma's beauty makeover when a magnifying glass is held in front of her eyes, and we are startled by how smooth Swanson's skin is. Swanson in real life was a health nut who fled from the sun, which no doubt protected her skin (she was 53 when she made the film), but the point in "Sunset Boulevard” is that she has aged not in the flesh but in the mind; she has become fixed at the moment of her greatness, and lives in the past. Billy Wilder and his co-writer Charles Brackett knew the originals of the characters. What was unusual was how realistic Wilder dared to be. He used real names (Darryl Zanuck, Tyrone Power, Alan Ladd). He showed real people (Norma's bridge partners, cruelly called "the waxworks” by Gillis, are the silent stars Buster Keaton, Anna Q. Nilsson and H.B. Warner). He drew from life (when Norma visits Cecil B. De Mille at Paramount, the director is making a real film, "Samson and Delilah,” and calls Norma "little fellow,” which is what he always called Swanson). When Max the butler tells Joe, "There were three young directors who showed promise in those days, D.W. Griffith, Cecil B. De Mille and Max von Mayerling,” if you substituted von Stroheim for von Mayerling, it would be a fair reflection of von Stroheim's stature in the 1920s. The plot has supplied Joe with a lot of reasons to accept Norma's offer of a private screenwriting job. He's broke and behind on his rent, his car is about to be repossessed, and he doesn't want to go back to his job as a newspaperman in Dayton. He is also not entirely unwilling to prostitute himself; Holden projects subtle weakness and self-loathing into the role. He goes through the forms of saying he doesn't want Norma's gifts, but he takes them--the gold cigarette cases, the platinum watch, the suits, the shirts, the shoes. He claims to be surprised on New Year's Eve when she throws a party just for the two of them, but surely he has known from the first that she wants not only a writer, but a young man to reassure her that she is still attractive. The thing about Norma is that life with her isn't all bad. She isn't boring. Her histrionics and dramaturgy are entertaining, and she has a charming side, as when she stages a pantomime for Joe, playing a Max Sennett bathing girl and then doing a passable version of Chaplin's Tramp. Joe is willing to be kept. The only thing the film lacks is more sympathy between Joe and Max, who have so much in common. I have seen "Sunset Boulevard” many times, and even analyzed it a shot at a time at the University of Virginia. But on this latest screening I was struck by its similarity with the 1964 Japanese drama "Woman in the Dunes." Both are about men who are trapped in the home, or lair, of a woman who simply will not let them out again. They struggle, they thrash a little, they look for the means of escape, but at some subterranean level they are content to be prisoners, and perhaps even enjoy it. Both women need a man to help them hold back the inexorable advance of the sands--in Norma's case, the sands of time.